Streamlight 88040 ProTac HL 750 Review, Should You Buy It? The popularity of tactical flashlights has led to the development of small, compact units that offer several features. For myself, I was interested in finding a tactical flashlight that offered all the advantages in terms of being versatile while outdoors or during a power outage, combined with having an effective self-defense weapon. My search consisted of many different flashlights on the market that managed to do both well while still being reasonably priced. The Streamlight 88040 ProTac HL 750 caught my eye early on based on the features it provides, but I wanted to reserve judgment until I had tested it first. In this Streamlight 88040 ProTac HL review, the features, pros and cons, questions, and the final verdict will be made on this device. The evaluations are based on personal use along in the wilderness with the product information found on the Streamlight website. The Streamlight 88040 offers several features that are commonly found among tactical flashlights, with some being more prominent than others. Beautifully Designed, Well Accommodated inside Hand! The 750-lumen high setting is more than enough to illuminate a large area in front of you and blind﻿﻿ any potential attacker. The medium and small settings are well suited for navigating in the dark out in the woods or when the power goes out in your home. The user selector programs are quite good at attracting attention thanks to the variations of the flashing. Otherwise, I found that most of the time I was only using one setting, so the programmable feature only comes in handy under certain circumstances. I was easily able to operate the flashlight with one hand only which is important when outdoors and trying to hold a map or look at my GPS. Plus, under the circumstances of being attacked, it’s nice to know that only one hand is needed to operate the light. I can quickly switch output levels from maximum to blind the attacker to medium or low in getting away and still finding a path. According to the manufacturer, it is waterproof up to three feet for up to an hour. So, I wouldn’t take it for scuba diving, but it will survive drops of the puddle or hard rain with ease. The 50,000 hours lifetime and rechargeable battery are expected with most tactical flashlights, so the 88040 ProTac HL by Streamlight did live up to the basic expectations in that regard. The LED technology makes it highly durable and reliable which is what I like in such a flashlight. I found the Ten-Tap programming to be interesting, but for the basic uses, it's really an extra feature of an already impressive design. Still, the ability to change the programming even in the dead of night was nice, so I’m glad the flashlight came with this remarkable feature. Under normal testing conditions which included clear and inclement weather conditions, I put the 88040 ProTac HL 750 through several tests to determine its flexibility, durability, and overall usefulness when outdoors in the wild and in urban areas as well. With all the excellent features, the rechargeable battery is an issue with me because I like to use standard batteries. However, the recharging speed is good, and it’s perfect for emergency use. 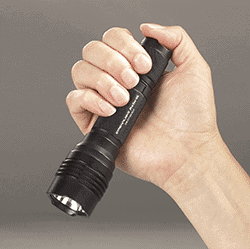 First and foremost, the 88040 ProTac HL by Streamlight is simple and intuitive to use. I didn’t have to think twice about changing the settings or going to the preprogrammed sequence thanks to the construction of the light itself. For situations when you have little time to think, it’s great to have a flashlight so simple to use that you can focus on other things. The high setting is quite powerful and more than brilliant enough to ward off an attacker whether they are human or animal like a bear. In doing a few tests with my friends, I was able to temporarily blind and distract them long enough to put some distance between me and them. The light itself is not very large, so as a weapon you can do better with other items, but it’s not bad and I can see warding off an attacker that is still disoriented because of the light. The durability of the flashlight is quite remarkable as it held up quite well under different environmental conditions. I have dropped it a few times on the floor and over rocky terrain and the flashlight hardly shows a dent or scrape. I was able to program the light easily, although I did have to follow the instruction manual. And, the compact design made it easy to carry on my belt or in my tactical backpack. With all the admirable features, the rechargeable battery is an issue with me because I like to use standard batteries. However, the recharging speed is good and it’s perfect for emergency use. 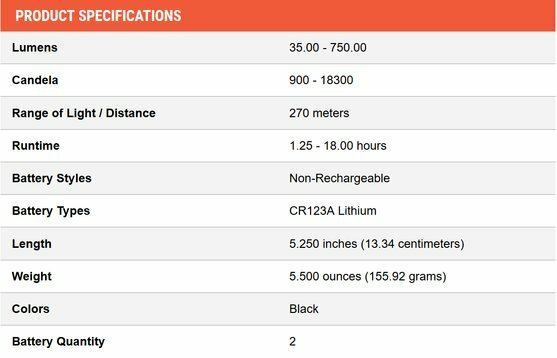 There are several questions that I had about using a flashlight with such a high lumen rating, particularly when it comes to injuring the skin. Q: Does it burn the skin? Only if held close to the skin for an extended time. Q: Can you defend yourself with the flashlight? Yes, you can blind and strike the attacker if need be. Q: Can you mount it on a pistol? Yes, but you may need to create a mount for it. Q: Do I have to use rechargeable batteries? Rechargeable lithium batteries, otherwise it might cause complications. Overall, the Streamlight 88040 is a compact, powerful tactical flashlight that holds up quite well in all types of environmental conditions. After considerable testing, I was impressed with its features and found it to be a superior flashlight for its price range. It is compact, easy to program, and provides an excellent bright light for self-defense. I recommend it for self-defense and if you need an extra light around the home in case of a blackout.